Currently on tour with Drake for his Club Paradise tour, rising rap star 2 Chainz (formerly known as Tity Boi) was arrested at New York's LaGuardia Airport today (May 22) when TSA agents found brass knuckles in his carry-on bag. According to TMZ, the rapper born Tauheed Epps was en route to North Carolina when he was arrested at the airport's Delta terminal. Police were called to the scene and Chainz was taken into custody for misdemeanour possession of a criminal weapon at 1:45 local time. As of press time, 2 Chainz is still in police custody, though a rep told TMZ that his team is "handling the situation." Earlier today, the rapper dropped a video for his T.R.U. REALigion track "Undastatement," which you can watch below. UPDATE: It turns out those "brass knuckles" were nothing but a piece of jewelry, according to 2 Chainz. MTV reports that what security officials found is the rapper's four-finger ring. 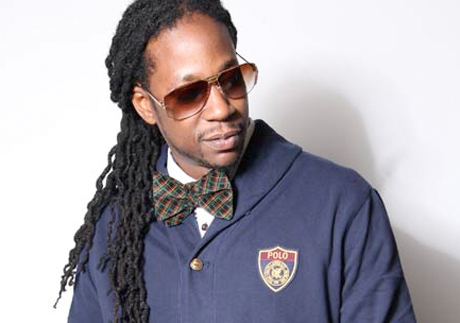 "They tried to assassinate my character, they tried to assassinate my swag," 2 Chainz said. "It was just a negative dilemma earlier where someone misconstrued a piece of jewelry for a weapon and stuff." Following the incident, 2 Chainz has been released from police custody and carrying on with his tour.